Dondakaaya/Tindora/Ivy Gourd/Gentlemen’s Toes/Kovai is a tropical vine grown for its small edible fruits. They may be eaten immature and green, or mature and deep red. The young shoots and leaves may also be eaten as greens. These are extensively used in Indian cooking. I usually prepare a simple stir fry or stuffed curry or pachadi with these veggies. It’s a family favorite. Today I am posting a recipe for Dondakaaya Pachadi on a reader’s request. This is a very simple way to prepare pachadi and it equally tastes so delicious with rice. Soak tamarind in some water and keep aside. Heat oil in a pan and add cumin seeds. After a minute add ivy gourd pieces + green chilies + garlic (if using) and sauté well until the ivy gourd appears slightly cooked. 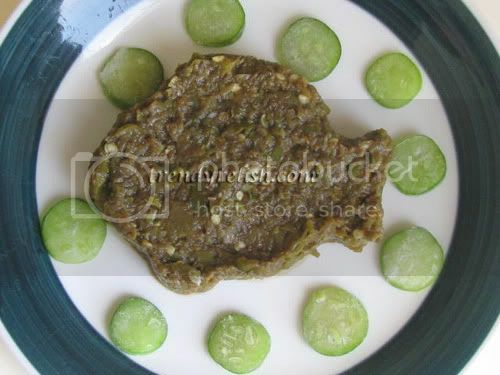 No need to cook ivy gourd until soft, half cooking is fine. Turn the flame off and transfer the contents to a plate to cool. Meanwhile extract juice from the soaked tamarind and keep aside. Later add all the contents to a blender jar and grind into a smooth paste by adding tamarind water little by little. Don’t add all the tamarind water at once as the pachadi might become too watery. Add enough tamarind water to grind the pachadi into a thick paste. Adjust salt. Enjoy this yummy and mouth-watering chutney with steaming hot rice and a dollop of ghee. YUM!! Interesting chutney .I have never made chutney with ivy gourd.Very innovative. ivy gourd chutney is new to me, but looks delicious. Never made tindora chutney...very innovative!! Chutney sounds awesome! SHould be great with rice and ghee! naku chala istam dondakaya pachadi.. ma amma chesthundi but nenu eppudu try cheyaledu.. sure ga chesthanu ippudu.. thanks for the recipe.. Delicious. This chutney is new for me, must try recipe!! woo somthing different one...presentation looks superb.. I just can't wait to try this!! 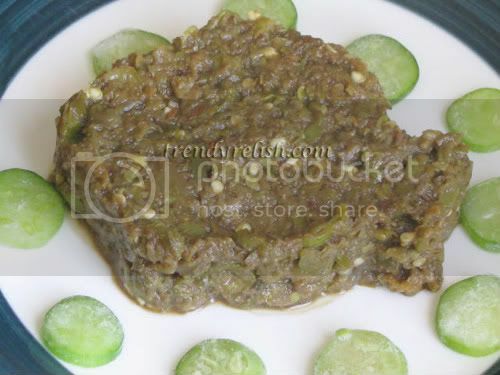 This chutney is new to me..but its worth a try..It does look delish..I'll follow ur tip and eat this with rice and ghee..